SpiritOres mod is a Minecraft Forge mod that adds twelve new ores to the game: Aluminum, Copper, Steel, Spirit, Charred Lead, Magnetite, Amethyst, Magma Spirit, Iridite, Lilithite, Telenium, and Ender Spirit. Several of these have special abilities. Also, craft the Spirited, Magma Spirited, and Ender Spirit ingots together and get a Dimensionforged Ingot. All the mod reviews currently out for SpiritOres are outdated - new mod reviews are needed and very welcome! Also, DO NOT PUT THIS MOD IN MOD DATABASES. Install the latest version of Minecraft Forge for 1.6.4 with the installer. Run Minecraft on the Forge profile once to create the "mods" folder. Download the latest version of SpiritOres. Navigate to your mods folder ("/Users/your user here/Library/Application Support/minecraft/mods" on Mac, "C:/Users/your user here/AppData/Roaming/.minecraft/mods" on Windows) and drop SpiritOres-X.X.zip inside. Start Minecraft on the Forge profile. If TimeLordHowl's SpiritOres mod appears under the "Mods" screen, everything should be working! 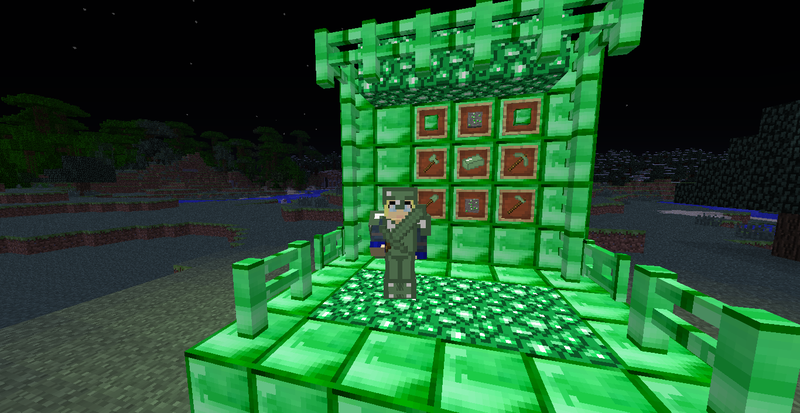 This mod is copyright ©(2014) TimeLordHowl and is the intellectual property of the author. Only Minecraftforum.net is able to host any of my material without my (TimeLordHowl) consent. It may not be placed on any web site or otherwise distributed publicly without advance written permission and crediting me (TimeLordHowl) as the owner and creator of this material. If you mirror this mod page or anything I've (TimeLordHowl) made on any other site, I (TimeLordHowl) may express my angst at you in the form of a lawsuit. Ingots in the recipes below can be any ingot, except for the crafting of the spirited dart gun. Feel free to put the SpiritOres banner in your description! This is a really cool mod - great job! EDIT: Did I forget to give you diamonds? Sorry - the pictures weren't loading before. They should be working now. Also, if anyone has ideas on how to improve the mod, feel free to post them! The next version will have a set of fence gates that go with the ores, and I'll try to implement the doors when I can--thanks for the ideas! EDIT: Fence Gates are being really buggy with the textures, so 1.3 probably will end up fixing the texture bugs and the Spirited Block recipe. Also, I might, might end up adding a fifth ingot plus toolsets plus armor. Thanks! One thing--can you post a link to this thread in the description? Hey Howl i finished the mod review! took me awhile to make L: Can you also put it on the main post? Whoa--thanks! I love it! Especially the bit where Steve crafts the spirited ingot. The texture should be fixed now, and the recipe for Spirited Blocks has also been fixed. The forge 1.7.2 development environment is really glitchy for me right now, but I'm trying to figure it out. In the meantime, I'll be on 1.6.4. I like the idea of bronze ingots and bows! I can't decide which to vote for. Well, all of the features listed in the poll are probably going to be added at some point, so you can just vote for the one you want to see first. Hey everyone! Just a quick heads-up/rant: Several websites (strangely enough, some russian ones) are trying to make money off of my mod without my permission, and without crediting me. Furthermore, the result at the top for googling "spiritores mod" is not this thread anymore, it is a website that doesn't credit me. If anyone reading this thread wants to put my mod on another site, a few requirements. PM me first to ask me if I'll let you. Credit me, and link to this thread and the website. Make the download link go to my download page. I'm trying to track how many downloads I get, so I know roughly how popular my mod is. You have reuploaded my mod to your website without my permission, posted my mod on your website without my permission and without crediting me, and have caused several other websites to link back to your page, where you are trying to make money off of my mod without my permission and without crediting me. I warn you, you are plagiarizing me. 9Minecraft does not own this mod. REMOVE MY MOD FROM YOUR WEBSITE, OR I WILL SUE. TimeLordHowl, creator and rightful owner of SpiritOres mod. Anyway. I will be releasing v1.4, and then after that v2.0 - v2.0 will be the first version to update to Forge 1.7.2. Just thought I'd let everyone know. I voted bows for me and all the other archers out there! Great mod btw! Will download ASAP! Good job, hope to see you continue with the great work! Diamonds and gold apples for you! P.S. What about ores in the nether? That would be a very nice addition to your epic mod! Charred Lead Ore - A dark-colored ore common in the Nether. It has the same armor, tool and weapon stats as iron, except it has increased durability/Unbreaking I enchantment. Magnitite Ore - A brownish ore that is about as rare as gold. The sword has the Looting enchantment, the toolset mines faster and the armor has no special effects. Unfortunately, Magnitite items are only on the same tier as Copper and Aluminum, as to stop them from being OP. Amethyst Ore - A purple ore that is as rare as Spirit ore. Diamond tier. The armor negates hunger, nausea and slowness effects, the sword has a slowness effect and the toolset has no new properties. Magma Spirit Ore - A fiery-looking Spirit ore that is as rare as diamond. It is on a higher tier than diamond (swords +8 damage for instance). The armor has Fire Protection enchantment, the sword has Fire Aspect and the pick autosmelts a la Twilight Forest's Fiery Pick. Toolset looks epic. OOH, yes! Amazing ideas for ores, elrock13! I'll get those in for v2.0 if I can get the textures together. Also, I just uploaded v1.4 to CurseForge. Once it gets approved, I will edit the main thread. Thanks! We're working on the bows right now, but the drawback textures are implemented strangely in Vanilla, so we're going with dart guns that work exactly like bows instead, but with many more uses - in particular Spirited Dart Guns. They're practically unbreakable, with 90,000 uses.